Production turnaround time is 4-5 business days. Choose from 5 Metal Print Surfaces for your Sierra Album Cover. Your image is printed on 0.045" thick Chromalux Metal for a superior, long-lasting cover. A modern curved spine wrapped in supple black leather finishes the couture look. Choose from professional photographic papers: Kodak Endura Luster Pro, Metallic Pro, or Fuji Deep Matte. For more information, see our Paper Types page. 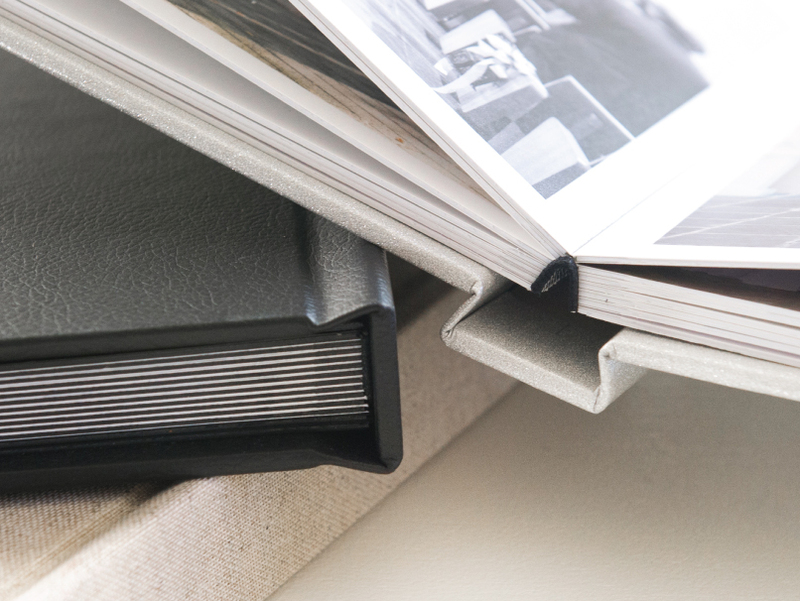 Choose either a Micro Gutter or Seamless Creased album page. The 2mm Micro Gutter is a traditional favorite and recommended for display albums which will get heavy use. 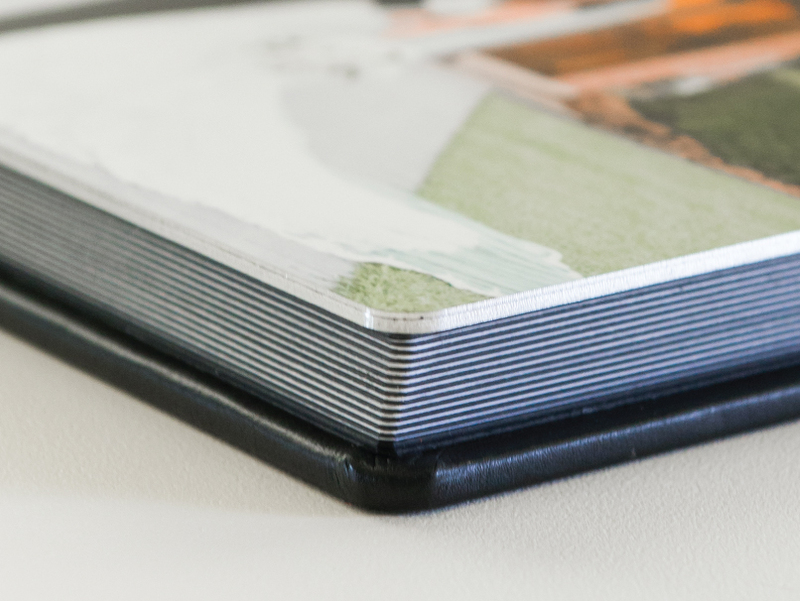 The new Seamless album page is made with a tight center crease for unbroken panoramic images. No additional charge. 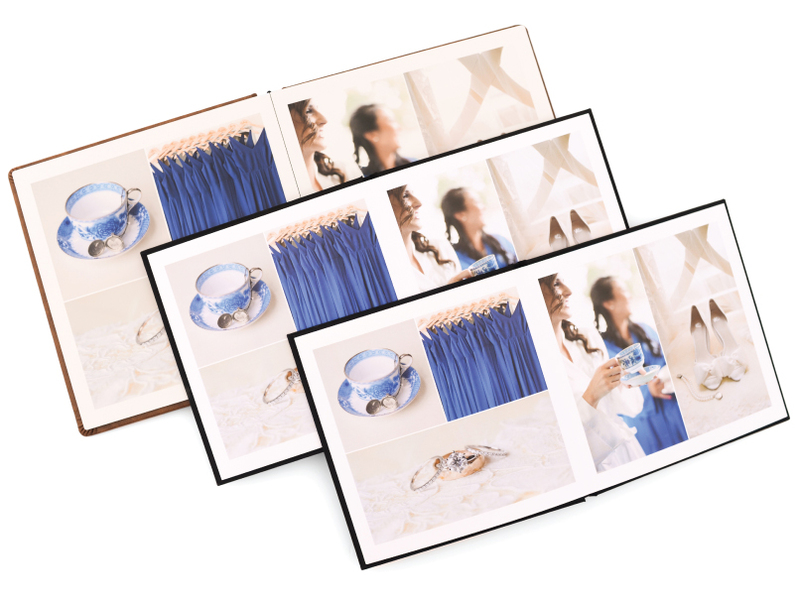 We flush-mount photographic prints on plastic inserts--not paperboard-- for thick, no-warp pages. Choose Black or White Page Inserts. Sierra Albums feature 1/8" Rounded Page Corners only. Cascade, our free ordering software, makes album design easier with built-in templates. Use the templates as-is or modify them by moving, resizing or adding new image nodes and text. Save your templates for future use. Start and end your album with our traditional Black End Sheets (shown, top) for a dramatic effect or White End Sheets (bottom) for a lighter look that so many high-key photographers love. Add your studio name or a special message on the inside back cover of any album. Limit 1 line of text with 29 characters maximum. Black, Gold or Silver Foil. $6. 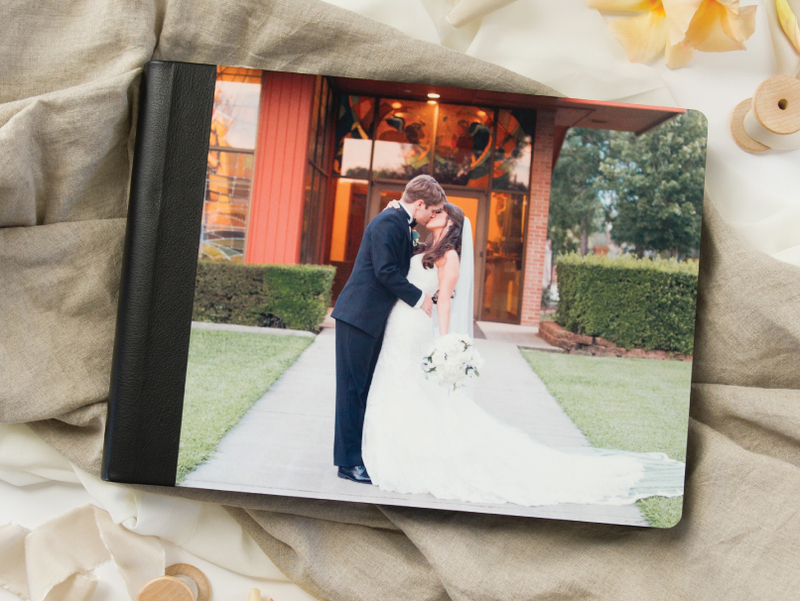 Add optional Gilding to your album pages. Gilding is a decorative process in which a coat of Silver (shown, top) or Gold (bottom) is applied to the edge of each album page for a touch of luxury. $26 per album. 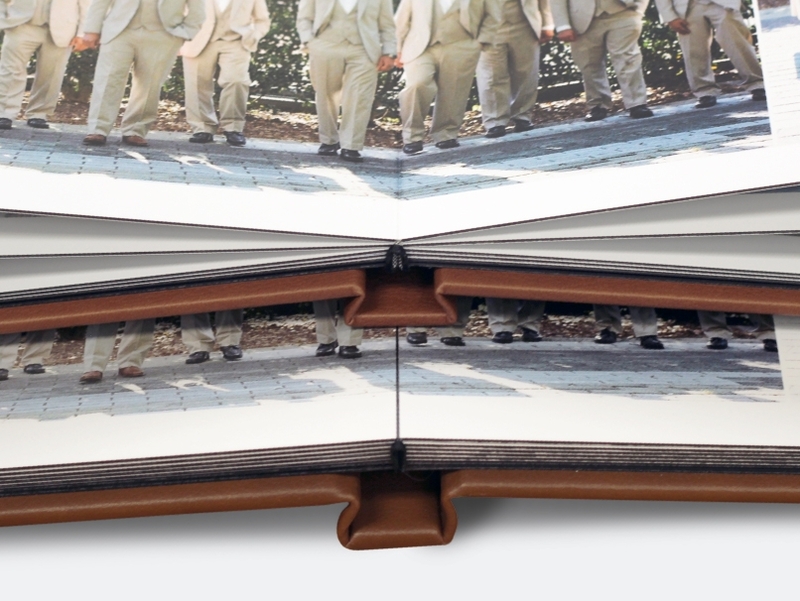 Companion Books are perfect upsells as smaller, press-printed versions of an album. Books feature the same layouts as the album upon which they're based, but with plain black fabric covers. Sizes 5x5" or 8x8" (for Mosaic, Tuscany or Echo Albums) and 8x6" (for Sierra Album). Companions Books require no additional design time, just tick a checkbox in Cascade checkout. First set of 2 is $72 then $36 each for 3 or more. Companion Books feature identical layouts as the original album but are smaller in size and have black fabric covers. Available in 3 sizes: 5x5" or 8x8" (for Echo, Tuscany, Mosaic or Glacier Albums) or 8x6" (for Sierra Albums). Select the "Add Companion Books" checkbox in Cascade to automatically add press-printed Companion Books to a Mosaic, Tuscany, Echo or Sierra Album. No extra design time required. High Gloss (formerly Vibrant Gloss) is a brilliant white high gloss surface for unsurpassed detail and vibrance. Our most popular surface. New Mid Gloss is similar in color intensity and detail as our High Gloss option, with reduced glare. Satin (formerly Vibrant Matte) has a smooth, very even and soft appearance with minimal glare. Sheer - Glossy (formerly Metallic Fade Gloss) shows the metal through the image, giving our Sheer Surfaces a unique translucent luminescence. Sheer - Matte (formerly Metallic Fade Matte) is the same as Sheer Glossy, but with matte finish with minimal glare. Sample albums have proven to be a powerful way you present your work to clients coming into your business or visiting a venue. Supply your local wedding coordinators and vendors with updated albums of your work. When ordering your album in ROES or Cascade, you will be asked if your album is a sample. Please check yes and continue with your order to receive the 40% discount. Each kit contains examples of our Mosaic Deluxe and Exotic covers, as well as Tuscany Leatherette & Leather covers (Tuscany Premium Leather swatches may not available). 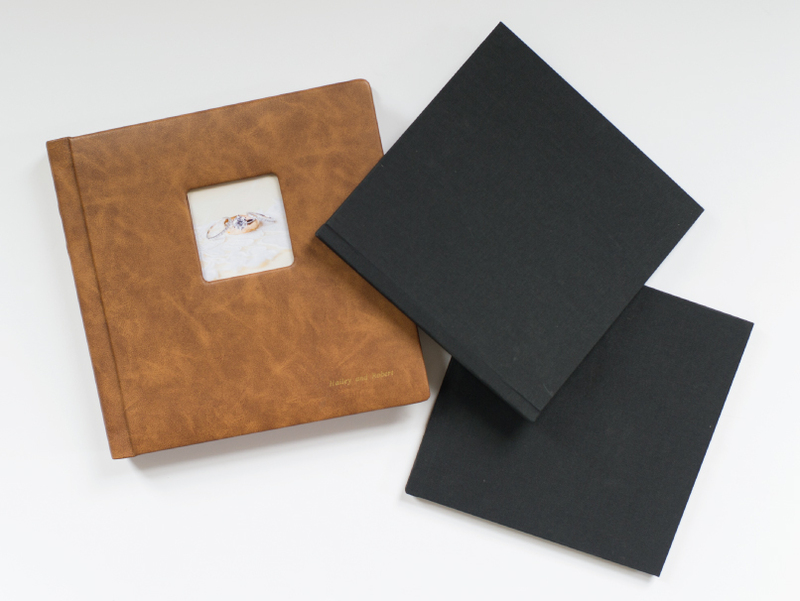 The kit also includes samples of our photographic and press papers with a variety of finishes.